Steve had arranged for us to pick up the key from a member of the Paul family: the owners, Steve told me, of most of this area of the Shotley peninsula. Tessa Paul’s house and garden overlooked over the estuary and pretty countryside, but any potential for envy was instantly dealt a fatal blow by the proximity of the Orwell Bridge and the A14. For a whole year, Erwarton church had been at the back of my mind: a friend from pottery who lives in Holbrook nearby had offered to take me there. She had mentioned it was one of her favourite churches. Finally I got round to suggesting a date, and on the second attempt we made it happen. I had a friend staying with me, and so the two of us set off for the Shotley peninsula. 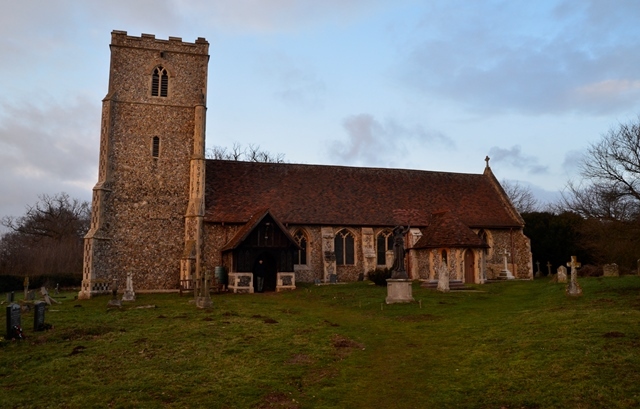 I had visited only one church there so far: Tattingstone. I’m not sure why it took me so long to go back. Perhaps because I didn’t fancy tackling the A12 around Ipswich. It was only a short distance, and didn’t involve crossing the Orwell Bridge – which must be my least favourite stretch of road in the whole county due to the scary side winds that sometimes blow over it – but nevertheless it was sufficient to delay my return. There was an alternative option of going through Wherstead, but the smaller roads are windy (of the other kind) and indirect, and I don’t feel confident finding my way. Not to mention the latter associations I have of the area involving locked church frustration and an upsetting encounter at Copdock. But recently I have discovered a third route: to head southeast directly to the Essex border (the Stour estuary) and take a left turn at Brantham. It might take a little longer to reach some churches closer to the Orwell estuary, but I think this is the best solution, especially as I have now found a ‘partner in crime’, a friendly bassoonist with a twinkle in his eye who lives in Stutton, near Brantham, and has offered to join me for duets in the remainder of the Shotley peninsula churches. 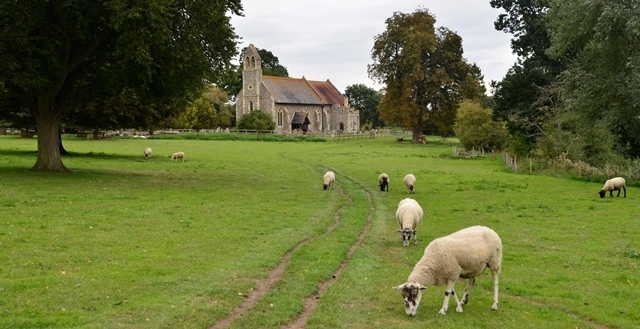 I knew that Langham church was in the middle of a field, and I was fairly sure it was kept locked. I had wanted to visit for a while, but was putting off the inconvenience of trying to get in. 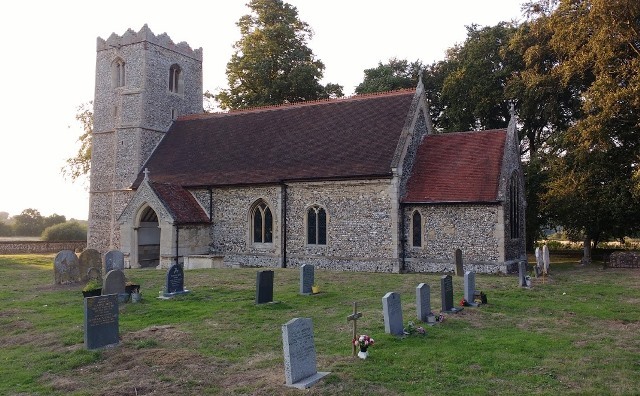 Finally the perfect opportunity arose: I had an evening concert in Wattisfield church on the day of the Suffolk Historic Churches bike ride. I emailed the vicar to ask if it was acceptable for me to turn up at Langham with my cello (not realising he was the same vicar I’d meet later in the day at Wattisfield), and, given the go ahead, turned up at the field gate later than I intended but still with twenty minutes before ‘closing time’ at 5pm. The people at the gate knew to expect me and directed me across the fields, kindly allowing me to take my car. I had once been to Lackford Lakes, and once to West Stow Anglo-Saxon village and country park, but that was the extent of my knowledge of this area north of Bury St Edmunds. 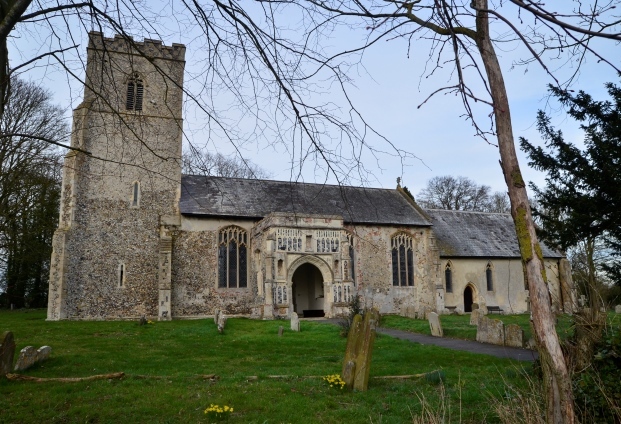 When I was asked to give a concert in Lackford church by a member of the audience at Dalham, I was even more delighted than usual by the prospect: in the afterglow of that wonderful occasion, I felt I could never have enough of them. Arriving at Lackford church was hardly less exciting than arriving at Dalham: turning off the main road and driving through a modern housing estate didn’t raise my hopes, but I soon emerged into open countryside with pretty views, and a perfect location in which to enjoy the late summer sunset. 5/9/2018 The approach of the end of summer is a sure way to bring into focus the things that you haven’t made the most of and don’t want to miss. This year I have noticed more of these things than usual. Luckily, though the much needed rain arrived in August, we have been blessed with a some idyllic days of warmth and sunshine at the beginning of September. After the summer rush I have also been blessed with a couple of quieter weeks in which I have the leisure to prioritise different activities: cello practice, writing, blackberry picking, jam-making and catching up with house and garden jobs that have been waiting for me most of the summer. There have been one or two of those inexplicable gremlins at work. 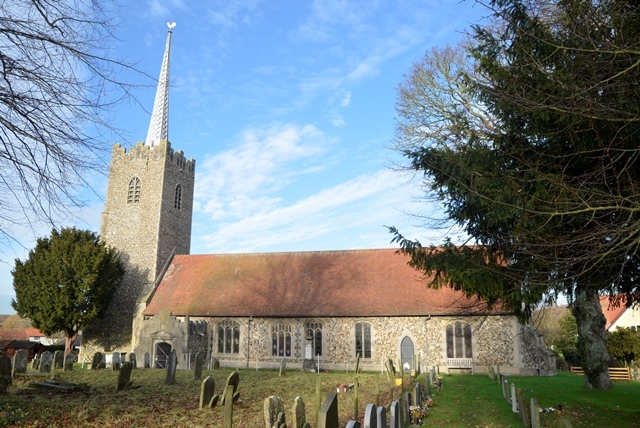 Almost simultaneously, I discovered that my photos of Hartest church were nowhere to be found on my camera, and that my phone had suddenly decided to delete all the photos on it. Dalham and Great Finborough churches were the only two churches I took photos of on my phone instead of camera. I have only one photo remaining, of the view from Dalham church, which I sent to a friend. I haven’t yet had time to revisit these three churches, but photos will be added here as soon as I do. 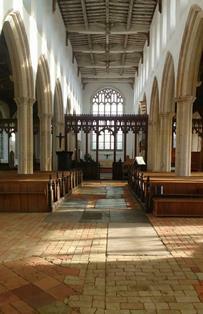 A concert in Hartest church had been on the books since last summer, and I was looking forward to it. I had resisted going inside before, even though I had driven through the lovely village of Hartest several times. Perhaps Cavendish is the ‘postcard’ Suffolk village, but to my mind, Hartest village green is far lovelier: smaller and therefore more intimate, and lined with mismatched, leaning old houses of many different colours. The church is on one corner of the green, next to the pub, where I enjoyed a good lunch during one of my previous outings to west Suffolk churches.